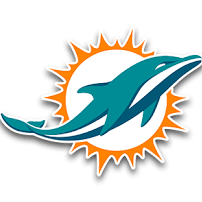 Miami under Gase has been a 2nd-half football team. Hopefully today is no exception. You're in luck because throughout the first 2 weeks, the Raiders are much worse in the second half. I wonder if the league will address this officiating crew. They're really over-officiating today. If they do, I am sure it will be quietly and outside of the public's eye, BUT this cannot be what the NFL wants refs to do. It's not a coincidence they didn't show a replay. Miami defense allows two 8+ minute drives and Miami is down by two scores. This is exactly how you lose this game. Let Tannehill distribute to his playmakers and good things happen. Still over a quarter to go. X GONNA GIVE IT TO YA! Albert freaking Wilson!!!! Yesssssss!!! With the high five from Grant! Haha love it! Miami 3-0. Pats (their week 4 opponent) playing on SNF tonight.